Hoping we might try to find a grand home for these very kind and affectionate boys. They are strangely bonded for not being siblings. 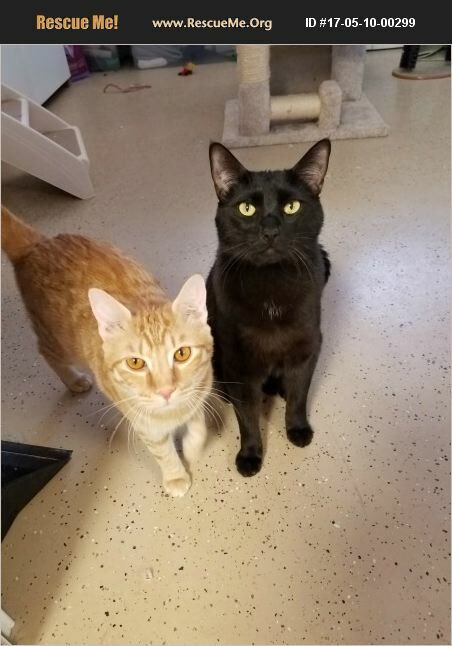 Here's Dexter (black) and Tigger (orange). Dexter is VERY dog like. Outgoing and loves to play by himself or sweetly with Tigger. Tigger is the quiet more reserved adolescent. He is learning how to use his voice for attention. He is getting comfortable enough to play with toys. He follows Dex around for reassurance. Both love to groom one another and will openly seek affection with there people. DEXTER is a neutered 2 1/2 year old male, he is a huge, 18 lb. muscular kitty, he is like a mini panther. He is super affectionate, has a little meow and is very vocal. He loves attention,loves to play and even loves to be picked up and brushed, an all around great kitty. He even does well with the large dogs that are at the rescue. TIGGER is approx 10 mos old neutered male orange tabby. He is a darling, sweet soul. He is quiet and timid in the beginning, but will come if called for attention from strangers. He loves to play with string toys and his best friend DEXTER. We would love to see both Tigger & Dexter find a home together. Tigger does ok with easy going dogs. To meet please call the rescue at 480-471-3520.